Patsy McGonagle is the Irish athletics team manager in Beijing. Here is an excerpt from his blog, which is posted at www.finnvalleyac.com. The Irish athletics team is currently in Japan. "Was running through the Donegal Oympians in my head earlier. It's an interesting study which reflects the different social challenges of a particular era and the limited opportunity. Let's begin with the first: 1948 London and a train journey for two Inishowen men. Ballyliffin man Patsy McGonagle had joined the Irish Army a number of years earlier during the Emergency and was at that time a Lieutenant based in Dublin playing soccer with Bohemians. The second Inishowen man, Emmet Mc Laughlin from Carndonagh, a student at UCD studying medicine and playing with the College. Beaten early in the competition finally by Poland; back on the train to Holyhead. Both now deceased. Patsy ended his career in the army in Donegal as a Commandant and Emmet emigrated to England. 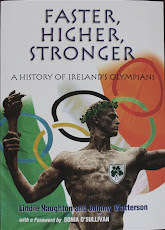 It's 1952 and Paul Dolan born in Ballyshannon is competing in the 200m. With his family living in Dublin, he had joined Clonliffe Harriers. He passed away a few years ago. Melbourne in 1956 is remembered particularly for that gold winning performance of Ronnie Delaney in 1500m. Boxer Pa Sharkey from Kincasslagh was working in Australia at that time and joined the team on their arrival from San Francisco by boat - a long, long journey. Pa has returned to his native Kincasslagh and the thought strikes me that someone out there should record his memoirs. Again in 1964, it's a boxer for the Tokyo Games - Brian Anderson who now lives outside Ballybofey was in those days boxing from Middle Row ABC, London; he won both British and Irish titles and was working as a stone mason for many years . There is a long gap then to the Olympic marathons of Montreal and Munich and the emergence of a distance runner called Danny Mc Daid from Glenswilly who headed off to Dublin to work and to further improve his athletics by joining Clonliffe. Danny now retired from his employment as a postman in Letterkenny and still retains a strong link with his sport. Now Philip Duignan and Chloe Magee will continue the tradition here in the Far East."